After having a really good time at the Cumberland Ale 10 last week, I was looking forward to going slightly longer this week at the Lancaster Half Marathon. We were in tip-top race condition, having spent the week boozing and destroying our legs with runs and hikes up mountains in the Lake District. For the icing on our preparation, we had a pre-race evening meal of a good hot curry from the local take-away and some more beer. I enjoyed a late night supper of four left-over samosas. We were ready. Lancaster is a little over an hour drive from where we're staying in Coniston. Start wasn't until an entirely civilised 11am so there was no need to get up at the crack of dawn. 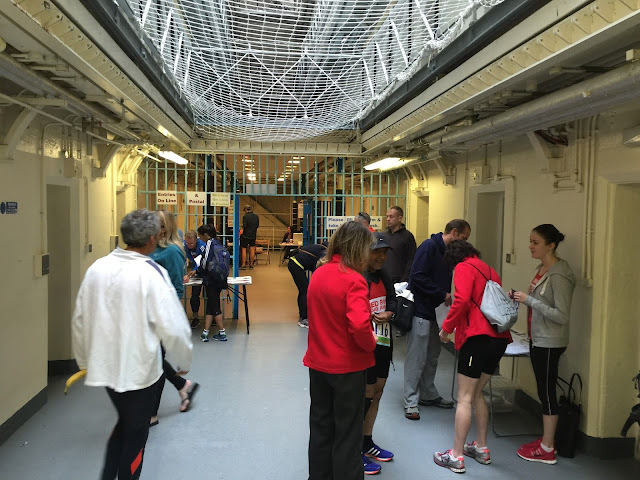 Registration was in the now decommissioned HMP Lancaster Prison (in the old Lancaster Castle, closed as a prison in 2011), and walking up the steep cobbled path to the entrance we wondered if this was the "30m climb in last couple of hundred metres" that you can see on the course profile map. Spoiler alert: It was. 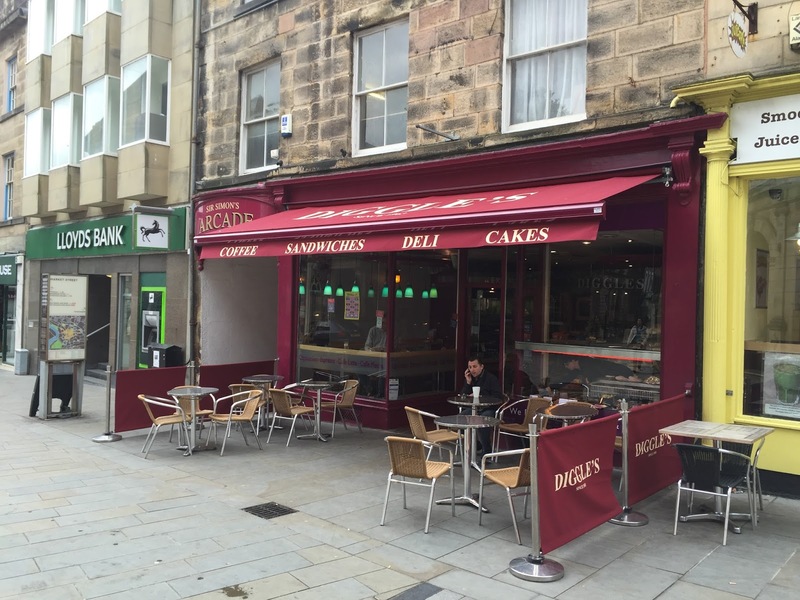 We registered, and disappeared to find some coffee in the sleepy town centre. Partly because we needed a coffee boost, partly because last night's curry was making itself known and there were only two (yes, two) toilet cubicles to serve the whole event and the queue was already insane. A minute or two's stroll led us to Diggle's which - although staffed by friendly people - served the worst coffee I've had for months, and had an amusing juxtaposition of stickers on their front window - one warning of CCTV in use, the other saying breastfeeding welcome... There was however no queue for toilets, which was lucky. We strolled back to race start (via another quick trip back to Diggle's because curry) which was in a field near the prison. We don't get the pleasure of running down the hill, just up it at the end. The course is mainly flat, so I thought I'd have a go at trying to get near my PB of 1:40:30 which was set at the Royal Parks Half Marathon in 2012. I was going to aim at 4:44/km which over the 21.1km of a half marathon would result in 1:39:52 - a slight PB, but also just under the psychologic boundary of 1:40:00. Apart from he course profile that Mrs found, I knew nothing about the course or where it went! We gathered in the field for a pre-race briefing through an entirely inadequate amplifier and speaker. The starter then led us through a gap in the end, and 20m down a road, before announcing that this was the start line. In no time at all he counted from 3 and yelled "Go!". OK for me as I was trying to get near the front, but annoying for those behind who were still filing through the gap. We set off down a wide coast road past some new housing, then dived onto a narrower hard stone packed path way. My first couple of km ticked over on schedule, but felt quite tough. Maybe I was aiming too high, and going flat out at Keswick parkrun the day before might not have been the best idea. At least the curry was silent, that last trip back to Diggle's had proved wise indeed. Two races were being staged concurrently, a 10km and a half. Before long we came to the 10km turn-around point. I'd been slowly catching and overtaking people, focussing on keeping my pace even, and then after the turn-around found myself suddenly alone - the few I'd just overtaken were running the 10km, as were my next few targets! I enjoyed the peace, and just continued trying to hit my splits. Eventually after about 5km we came off the pathway, and out into the open. I was wondering if we were going to run 10km up this path and then turn around and come back - thankfully not, that would have made for a very dull course. As it was there was a loop at the end with a little out-and-back section to make up the distance. It was on this section I passed Mrs, she had been a bit gloomy about putting in a good time, but here she was no more than six or seven minutes behind me at the half way point - she was flying! It was harder to pull people in now as we were well spread out, and I found the on-road section a bit demoralising. I was still on pace, but the surface was uneven and you never feel like you're making much progress when you're running along a wide road with scrubland to look at. Before long we turned back onto the stone packed path, and it was time for the final third of the course, back down and into Lancaster, and up the hill. I was managing to hold pace, but it was getting harder. A few km splits had crept to the 4:50 mark - I clearly wasn't going to PB or get under 1:40, but it was going to be a good time none the less. 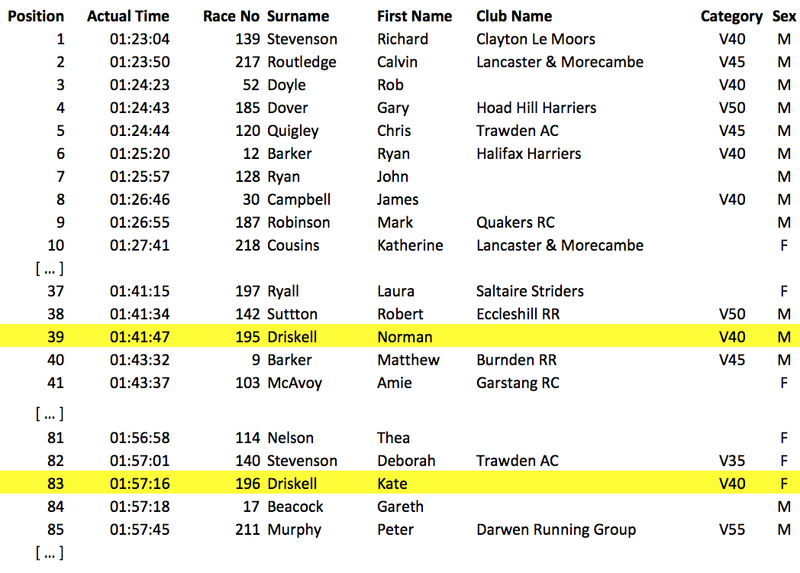 I think in a larger field I may have been able to go slightly faster as I would have tried to pick people off in front of me, as it was I spent the last 6km chasing the same girl (Laura Ryall, according to the results) who varied from about 50m to 100m in front. I lost two places as a couple of very fit looking chaps overtook me, clearly going for an easy first half then winding it up towards the end - they quickly disappeared from sight. Finally, back down the promenade, and up towards the Castle again. I'd been ramping up the effort to hold my pace in the last few km, and had very little left for the hill. 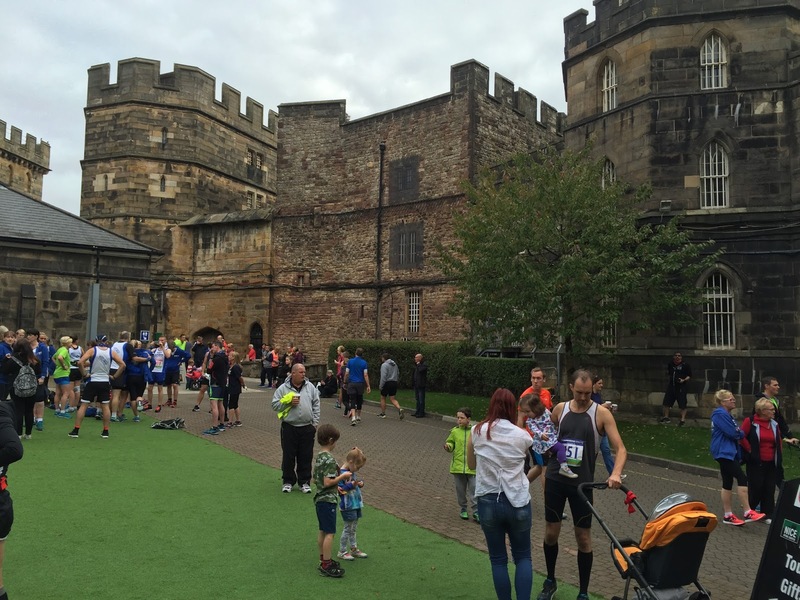 I just about managed to keep running up the main rise, then regained my breath on a short flat spot, then sprinted the last few 10s of metres up through the Castle gates and across the line. 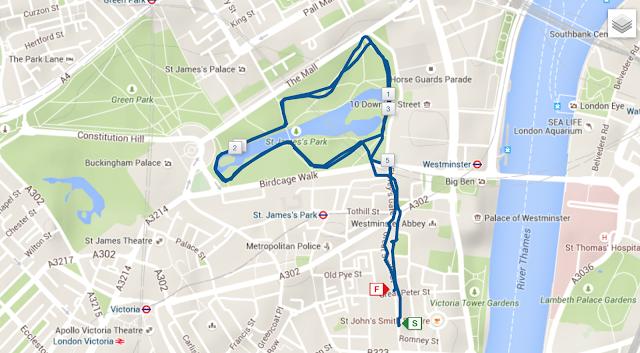 Strava was impressed with my effort! My final time was 01:41:47, just 76 seconds outside my PB, and only the second time I've run under 1:50. I'm very happy with that given my PB was set in the year I completed two full and two half Ironman events and was about the fittest I've ever been in my life. And, unlike Royal Parks, this time my knee didn't explode! I was 39th out of 177 finishers, 32nd out of 91 male finishers, and 8th out of 20 in my age group. 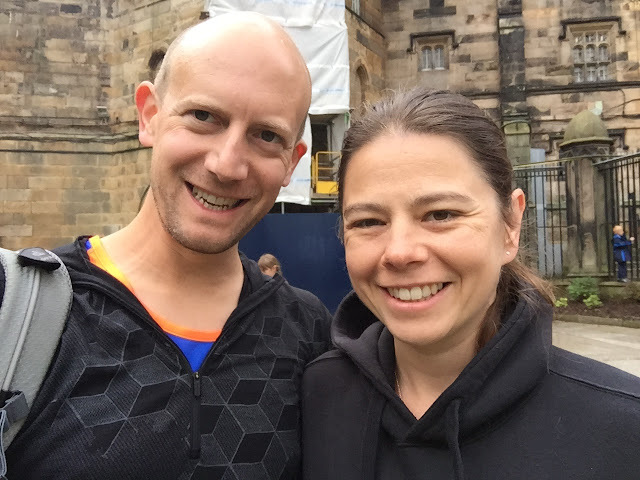 I sat back down at the finish and waited for Mrs to come in - she finished in 01:57:16 (83rd place overall, 25th out of 86 female finishers, and 6th out of 28 in her age group), a new PB by over six minutes, and her first time breaking two hours. Wow! Looking remarkably fresh for a 6+ minute personal best! 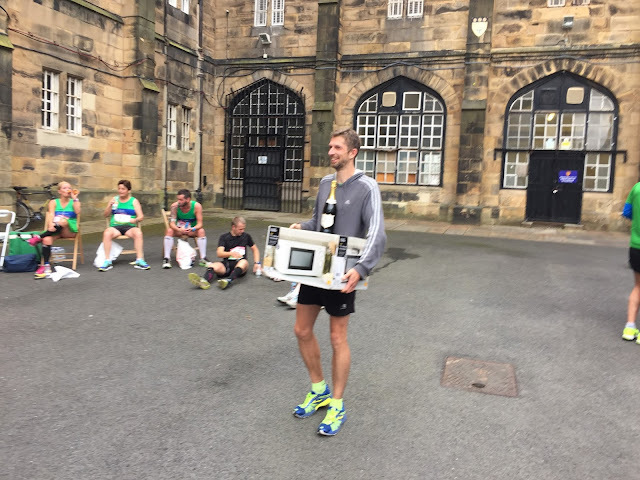 First prize was a microwave and some champagne! 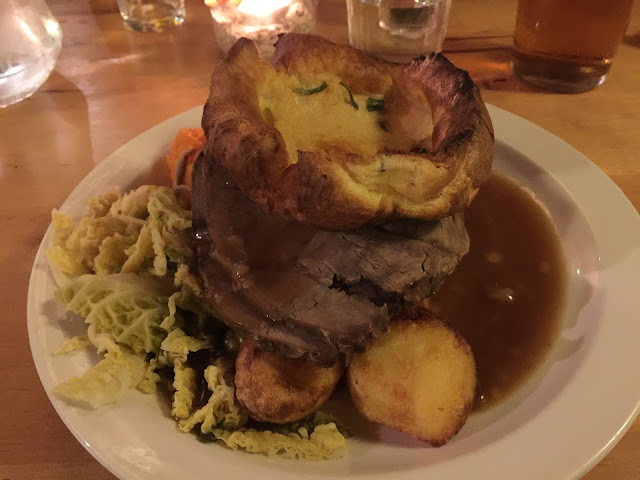 We were in urgent need of some breakfast, so found the nearest pub that looked like it was serving good food and immediately demolished a Sunday roast and pint of local ale. I still find it impressive that we can put out so much effort "on empty stomachs". The sports press will still have us wedded to needing to hydrate before we're thirsty, consume sugars continually, and eat and eat and eat. Three years into a low-carb high-fat lifestyle (yes, not strict, but under 50g carbs per day for the vast majority of days) and my fat-adapted body can run hard for a half marathon with nothing more than a cup of black coffee in the morning. We hiked for over three hours up Coniston Old Man (peak of over 800m) last week, and I had a 2:45 run round the lake the previous day on similar. And to finish, a small piece of analysis - yes I think it's the best pacing I've ever managed to pull off in a race and there was no classic explosion from going out too hard, but although I didn't realise it until I plotted the kilometre splits on a bar graph, I was actually slowing down. I've removed the last two splits as they include the hill and so skew the trend line. Note the y-axis scale is considerably zoomed in. Still my second fastest half marathon ever, so I'm not complaining too much! Most years Mrs and I rent a cottage somewhere for a week or two to "get away from it all". It's a perfect opportunity to explore some interesting parkruns that we wouldn't normally get near to, and more recently we've been looking at local races to enter too. 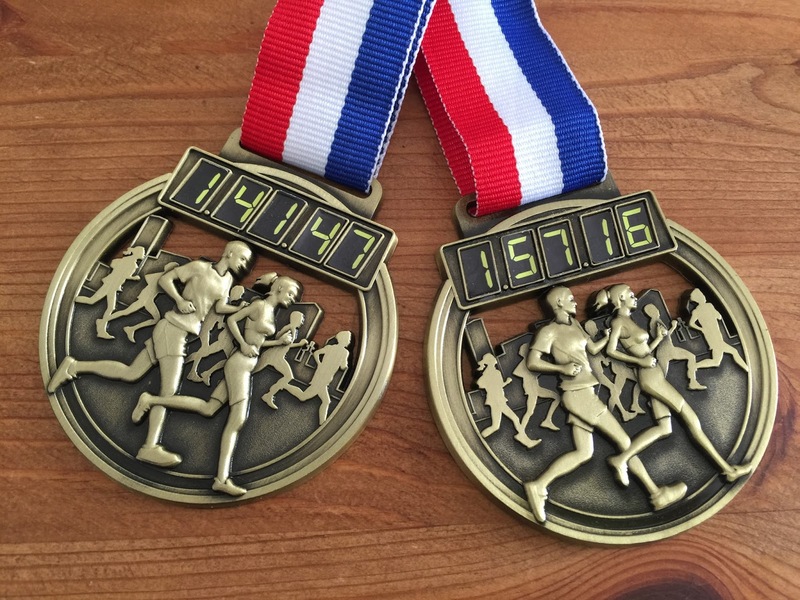 We had a fantastic time at the Malmesbury Half Marathon a couple of years ago. Last year was straight after Mrs had run the entire 184 miles of the Thames Path so I was a solo coastal trail runner down in Newquay. This year we've come up to the Lake District National Park and are staying in Coniston. Picking the parkrun was easy (there are only two in the region of the Lake District - Fell Foot and Keswick), and we took to the running sites for some interesting local races. We had a nice run (despite the monumental downpour) at Fell Foot parkrun on Saturday, a good warmup for the week's first local race - Derwent AC's annual Cumberland Ale 10 on the Sunday. We arrived a bit early at the start, Jenning's Brewery in Cockermouth, right up on the North Western edge of the Lake District. In fact, I think we were the first people there. They hadn't even set up the registration table yet. We hung around a bit until we could sign in, then went to wander round to find a coffee. Options were limited at 10am on a Sunday morning in Cockermouth, but we found sanctuary in Merienda, a relaxed little independent coffee shop (I know the site says Keswick, but they're in Cockermouth too). Charged with some serious caffeine, we walked back to Jenning's Brewery for the start. 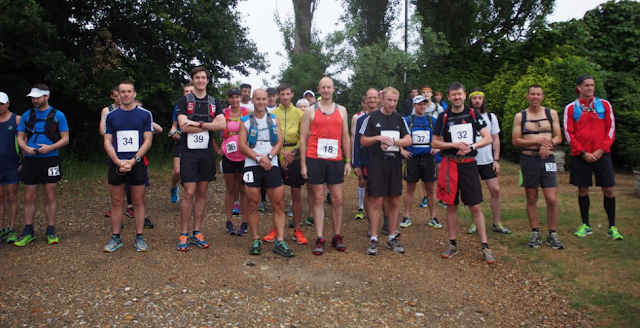 Entries are capped at 100 but there can't have been any more than 70 on the start line. It was a very friendly relaxed atmosphere, and I was looking forward to the "undulating" course (I've learned that "undulating" is one of those running euphemisms). Mrs and I decided to run our own races rather than stay together, I positioned myself mid-pack and she headed a bit further back. With very little fanfare and no countdown, there was a "Go!" called, and we were off! It's a 10-mile lollypop-styled course with a 3 and a bit mile out-and-back with a loop at the end. The undulations got started early as the first mile was all uphill! I took the hill gently, and got into my stride in the second and third miles. I felt great, running was easy and my form was good (or felt good at least, no idea what I actually look like!) and I started pulling in the excitable runners who had started too fast. With such a small field we quickly separated out and found our paces. All the way round I gradually reeled people in, very slowly making one or two places per mile. I loved it. I ran the gentle hills as if they were flat, and ran the steep hills conservatively (but without walking). Downs were the best. Mrs told me a long time ago that people generally run the ups too hard and the downs too easy. Ever since then I've made an effort to run down hills quickly - and it makes a big difference, a really big difference (try it). While I was running I split the race into three - first three miles (should feel easily in control), middle three (turn up the effort), final 3 (push to the end). I was discounting the last mile as I now knew it to be all downhill. I didn't have a target time, when Mrs and I were discussing it I thought an hour and a half might be good - she thought that was too fast for a hilly 10. There was a lovely fast and steep descent just before the loop, I commented to someone "What goes down..." and tried not to think about running up it in a few miles time. As it was, I was on a long climb on the loop when I passed the 5 mile sign. I looked at my watch for the first time and it showed 40:08. I was very happy with that! I began to think that with the last mile being downhill then a one-hour and twenty minutes time might be possible. I decided to go for it. At mile 5 and a half there was a lovely downhill that went on forever, I opened up and overtook someone who had been sat a few 10s of metres in front of me all the way up the previous climb. Reaching the end of the loop, I prepared myself for going up the hill I'd enjoyed earlier. It was very steep - the closest I came to walking - but with 1:20:00 in mind I pushed on. Reeling people in now was harder as we were all at roughly the same speed. All through the return leg I was driven on by someone I'd had in my view for some miles. He was faster on the ups, and I was faster on the downs, but he was slowly pulling away. I redoubled my efforts, making sure to run the ups and keep pushing off the top (a technique I've carried over from cycling). It felt a lot lumpier than this! Huffing and puffing from the climb I checked my watch at the marker - it read 1:12:08, I was a little over the 8 minutes, but I knew most of the last mile was down. I didn't want to relax though, I knew it would be tight. I pushed all the way down back into Cockermouth town, and ran hard down the steep narrow road into the brewery. The finish funnel looked just like a parkrun funnel, and pushing right to the end I ran right through the line (no slacking off!). The previous finishers were all milling around and clapping and cheering each new runner - there were a good few dozen in front of me. I was handed my complementary bottle of beer, and staggered off to get my breath back. I checked my watch. It read 1:19:18! I'd taken out the last mile in 7:09 and come in under 1:20:00 - a clear 10 minutes faster than I was expecting! 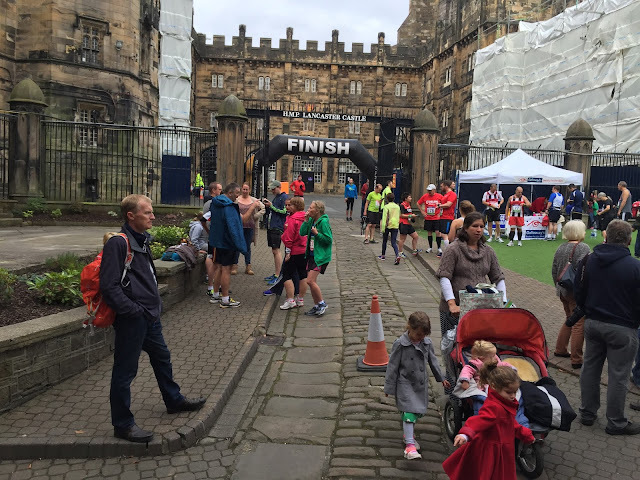 I wobbled about near the finish funnel and clapped the arrivals waiting for Mrs. She arrived in no time, chalking up 1:31:40 on the clock - also a fantastic time ahead of expectations. We were overjoyed! So overjoyed we helped demolish the buffet. Mrs arrived at quite a pace! The official results agree with my watch time within a second, putting me at 1:19:17. I was in 36th position and 6th in my age group. Mrs was in 55th place and 7th in her age group. The winning time was an incredible 58:40! Let's see what we can find for next weekend. I've noticed a race around Wimbledon Common a few times, and today I was in it. It's the Wimbledon Half Marathon, put on by Run Through events. And it was wet. Very wet. The rain started soon after we arrived, and gradually got harder. The first wave went off at 9:30, for those aiming for sub-1:40. Second wave three minutes later for sub-1:50, third after another three minutes for those aiming for the significant 2-hour mark, and then finally fourth wave with everyone else. I was aiming to beat my Hitchin Hard Half time of 2:00:07 so I placed myself in the sub-2 wave. Mrs was also aiming to beat her time and go sub 2:15, so she went in the fourth wave. 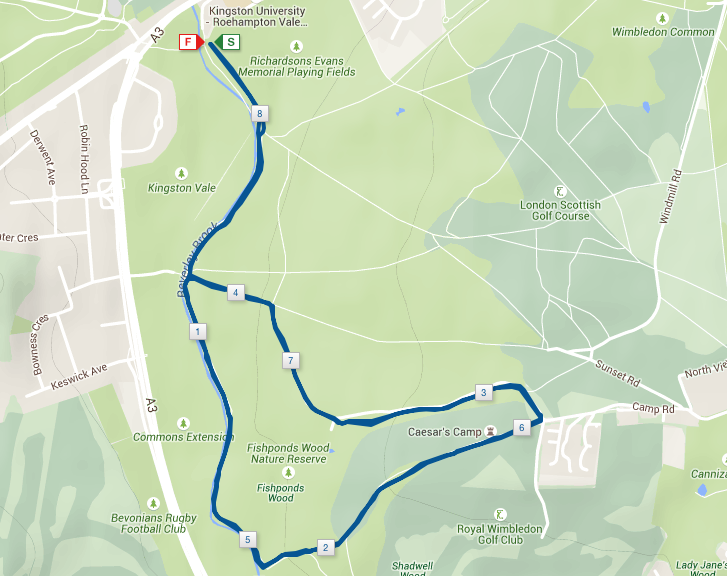 The first couple of km are mainly uphill, climbing from the recreation ground up towards the Wimbledon parkrun route and the Windmill tea rooms. I took a nice easy start, 6:00 for the first km, 5:50 for the second. Once up on the flat middle section though I felt good, so pushed a little harder. 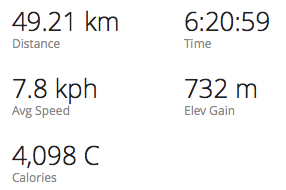 I was aiming for an average of under 5:40 per km, so was quite pleased when I knocked the next few off at around 5:20. What goes up must come down, so it was a nice long fast downhill back to the river to complete lap 1. I felt really good, and was running at a good even pace. I'd been steadily overtaking people all the way round, and was enjoying picking off who would be next. Good pacing (green line) and a few sharp ups and downs! The uphill section was a bit tougher this time, but I engaged my glutes and kept upright, with high cadence - that seemed to work well. The rain was absolutely torrential, despite being in a forest for most of the route we were all completely drenched to the skin! Into the final third of the race distance and I was having to work harder to keep the pace up. I was confident I would break 2:00 and it looked like I'd even get under 1:55. Finishing the lap there's a little nasty hill that nearly killed me, but then back onto the grass of the playing field for a finishing stretch and a bit of a sprint to the line. The official results are out already, and with them the proof that I'd smashed my target of 2:00, coming in at 1:52:27 for 180th position overall. 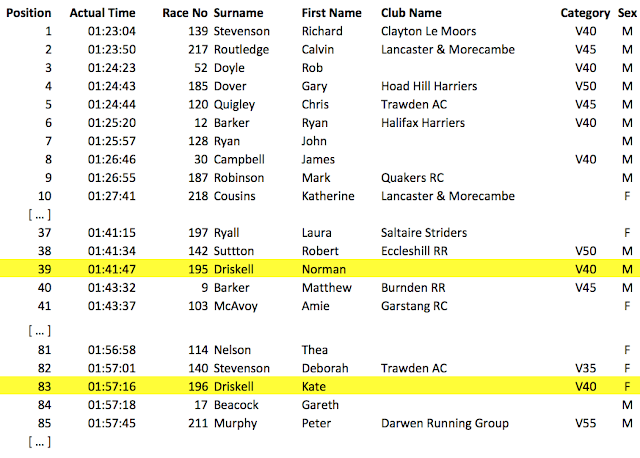 Mrs also did absolutely amazingly, finishing in 2:06:44 for 300th place overall. We're both super-happy with that, on a muddy, soaking wet, 100% off-road course (with some hills for fun). The only other thing I wanted to do was negative split (do the second half faster than the first). Despite logging my runs into about a half dozen different activity/performance tracking sites, I can't see an easy way to find that out (you'd think "What was the time when I got to 10.55km?" would be easy enough to work out!). Doing it rough and ready, my 10-11km split was 5:48, so if I add 0.55 of that to my 10km time, that's 53:51 + (0.55 x 5:48) = 0:57:02 for 10.5km. Take that from my overall time of 1:52:27 to get the second half, and that comes to 0:55:25 - so I negative split by 1:37! I'm very happy with that!! LCHF (Low Carb High Fat) breakfast of champions! Dinner time now - and a richly deserved curry at Khanage - the best curry house in Wimbledon. The third running of the Thames Hare & Hounds 2nd Sunday 5 - the new regular 5-mile race held on the second Sunday of every month. It's a great little run, low-key and "local" feeling, but with good running club standards from the TH&H members that I get some stiff competition. 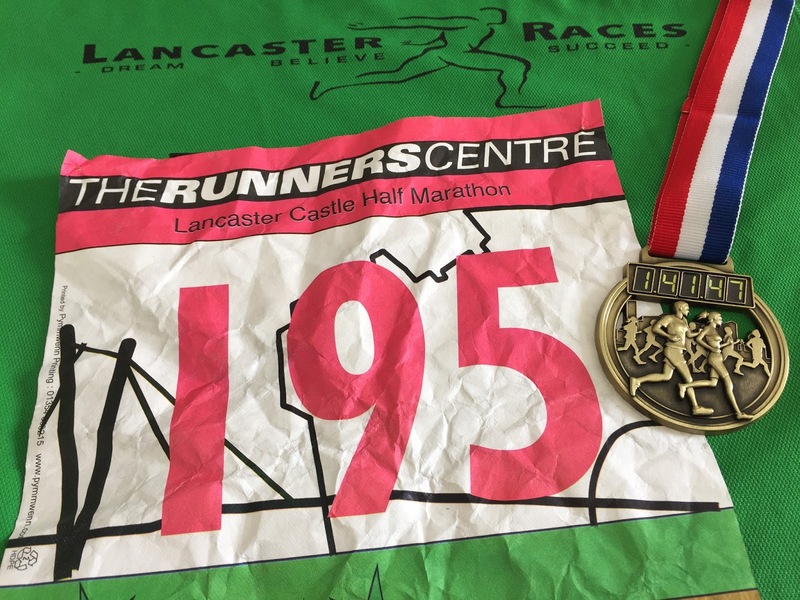 Last time I managed to come last, despite putting some serious effort in, so this time my race objectives were triple-printed: A) Don't walk up the Toast Rack; B) Don't come last; C) Go for a PB. I drove up to the Windmill carpark on Wimbledon Common, it's a couple of km from the start/finish so a jog down makes for a good warm-up, and a gentle stroll back is a nice cool-down afterwards. Today's run was a little different, it was doubling up with a local school for their off-road fun run. At the start there were a couple of dozen little kids - everything from three to maybe seven or eight years old would be my guess. They looked cute with their giant race numbers on, and there was lots of excitement from them! I was expecting them to be doing a lap or two of the playing fields, or "out round the cone and back" - but nope, they were doing a full lap of the same course the grown-ups were! 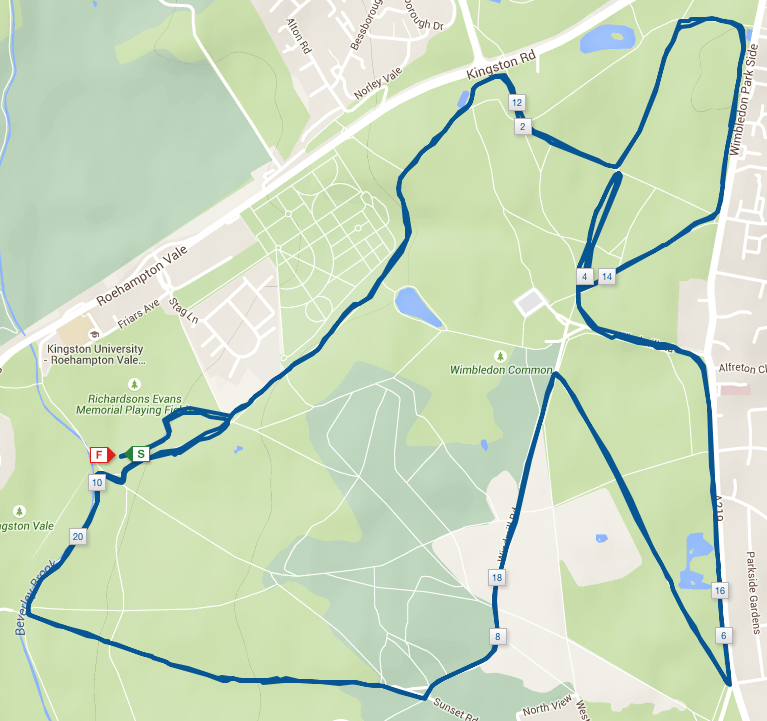 A little over 5km, all off-road, including up the Toast Rack!! The kids had a great little warmup, jumping and bouncing, and then we all lined up to start. I was a bit concerned... I've seen kids start at the front at parkrun and the big risk is they just get mown down - but not this time. The little darlings shot off into the distance, leaving us oldies for dead! I laughed out loud for the first minute or two - running surrounded by tiny kids was hilarious - they were going at absolute full tilt, and all the parents were lagging behind yelling "pace yourself! ", "slow down! ", and the like. They'd slow down dramatically, then speed off past you again, then slow down - it was certainly not like any other run start I've experienced! I found a good pace, including running up the Toast Rack hill, and pushed down the other side. I'd overtaken a few of the kids and was running mainly on my own. Coming to the end of the first lap the kids and parents turned right to go back to the start/finish, and the 5-milers took a left for a second lap. After the corner I could see a few people in the distance, including the woman I'd had a sprint finish to beat in the first race back in May. I kept the pace up and managed to run (sort of!) up the Toast Rack for the second time - first time in the three races I've not walked a bit. I overtook one of the cluster in front (yay! not last!) and set my sights on the next person. I overtook him a few minutes later, and still had the woman in my sights - she was also finishing at a good pace. Completing the second lap, turning right this time, and just under a kilometre left. I managed to reel her in a bit, and as we turned for the final 200m out of the forest and onto the playing fields, I pushed hard. I was certainly gaining on her, but there just wasn't enough race left - plus I was running out of lungs and legs. She beat me by about 20m. The hard finish was good for my time, certainly a 2nd Sunday 5 personal best. The course start/finish was again in a different place so we've had three different routes now. I'll keep track of average speed as well as overall time. I'm very happy with that - good progress over the three months. My long-term objective for this race is to get under 40 minutes. I was amazed by the tiny kids - some of them ran really hard and didn't slow down at all (I certainly hadn't caught them all on my first lap). A real contrast to a parkrun I was at recently where I heard a mum tell her crying daughter "5km is too far for little girls, you can run when you're older" - tell that to this lot, over 5km, all off-road, including down the side of a river with steep banks - and they were fast as anything. When I was walking back up to the car I saw the youngest of the children finishing, a child laughing and happy just going down the field toward the finish area. She was no taller than my knees, and seemed to have had the best morning ever! A good reminder of just what kids are capable of - and it's normally far more than we realise. I have had a previous attempt at an ultra, and it didn't end well. I had to stop after 30km with my old friend ITBS irritating my knee. I have wanted to take another go for a while. 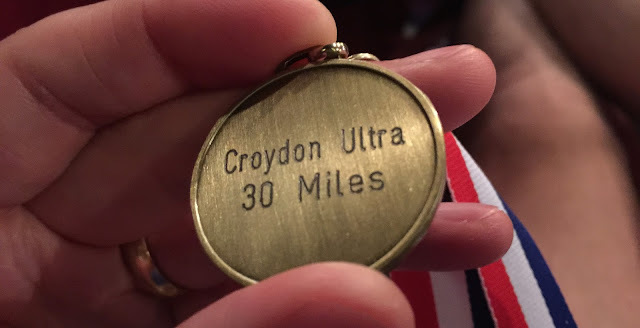 On a whim I signed up for the Croydon Ultra about 6 weeks ago. I've been running relatively regularly, and relied on running every day in June (Juneathon) to give me what I needed. I went to check the circuit out a fortnight ago, and didn't enjoy it too much. So I went back for another go a few days later and had a much better day. I still wasn't entirely confident I'd make it round two laps, but it was worth a shot. I got up early and ate a normal breakfast before heading out. I know I can do three hours of exercise on a cup of coffee, not sure about six! 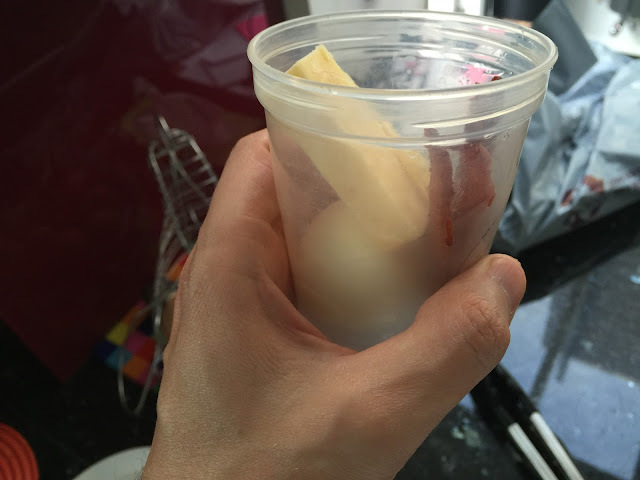 The night before I made a couple of snack packs too - a boiled egg, stick of cheese, and a bit of bacon. 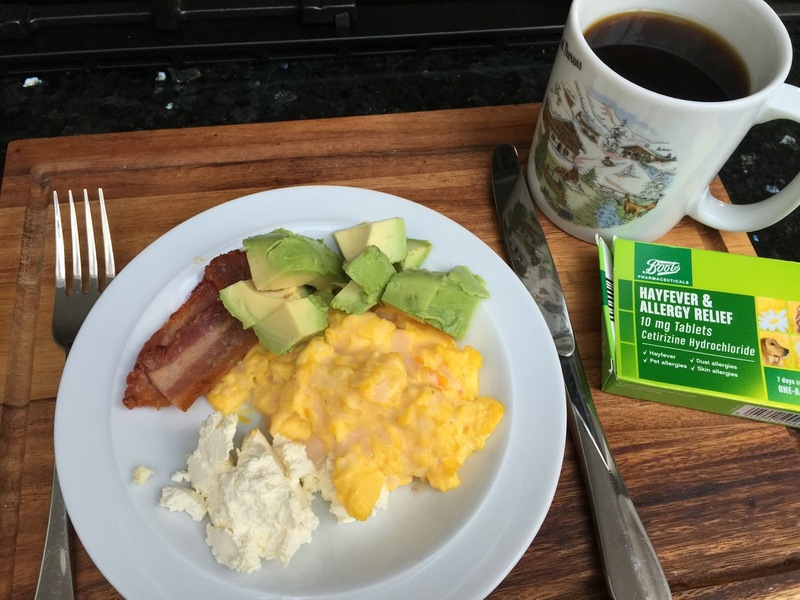 I was going high-fat low carb all the way, no cakes, sports drinks, or sugary sweets for this athlete. The trip to the start was easy, just 30 minutes on the tram. The two-lap course meant easy access to my bag at half way so that, plus an aid station half way round, meant very little to carry. I wore my trusty Flip-Belt with iPhone and inhaler, then in my shorts pocket an emergency bank card, cash, and copy of the route. Pretty sure I didn't need the instructions thanks to my familiarisation runs, but better safe than sorry. Race start was at 9am, and at about 8.45 it started drizzling. By the time we started it was really raining hard. I decided to go for shorts and a vest, expecting warm dry weather - at least in a vest I wouldn't get bogged down with the weight of wet clothes, or poach myself in a waterproof top. At 9am on the dot we set off. There were around two dozen of us. A lot like the most recent 2nd Sunday 5, everyone shot off into the distance. I was fairly sure that within the first kilometre I was in last place. I didn't mind, I'm OK with that. Maybe they'll come back to me later, maybe not. For me it's about getting round. There were a reasonable number of orange arrows painted onto the floor at opportune moments, and a few orange streamers tied to trees. Better markings than I was expecting for a small low-key race. The rain continued, and I held a good pace. Jogging along the flats and downs, walking briskly up the hills. 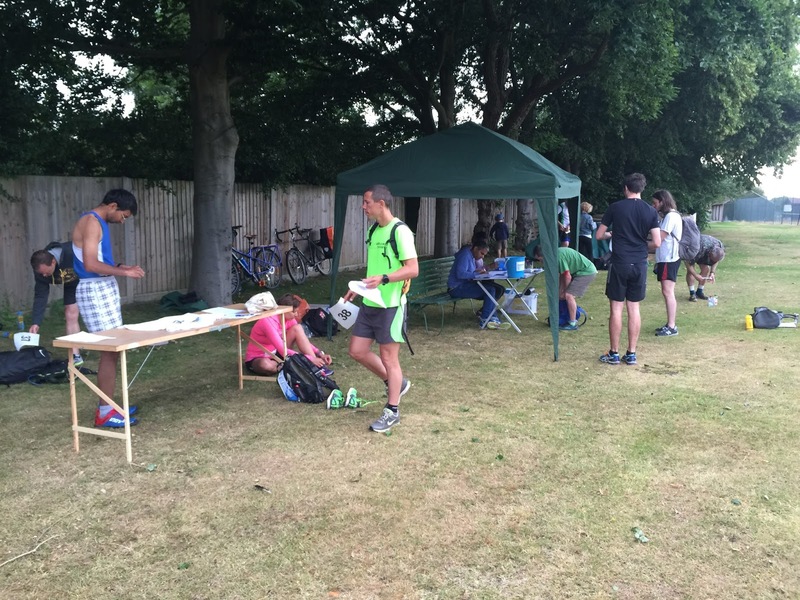 The White Bear aid station came round fairly quickly, I had a cup of water and a surprise piece of cheese (I was surprised, not the cheese) - nice to see something other than the usual sugar fest - maybe ultras are more accommodating? There wasn't any coke/pepsi, just flat water or orange cordial - it looked somehow more appropriate than the sugar-fest aid stations I'm used to from Ironman. I'd enjoyed the first half of the lap, it's interesting and mainly trail. The middle section was country lanes, bit boring, and then the last part was mainly around suburbs - quite housing estates and some seriously nice houses. I got back to the start to see two runners just leaving, maybe I wasn't so far at the back after all. I stopped for a few minutes, I don't know what my mid-point time was, I'd already decided I didn't care (within reason) about the time - it was about finishing. I was wearing my Garmin and it was recording, but I was just ignoring it. It buzzed regularly as the kilometres ticked by, but they passed uncounted. I consumed one of my snack pots - it was good! Felt so much more reviving than an energy bar or gel. Setting off from the aid station to start the second lap I was still going OK. I clearly had a few hours' running in my legs, but I wasn't too tired. I enjoy the first third of the course, on the vanguard way, and was looking forward to seeing it again. It had rained all the way round lap one, but had slowed to a drizzle now. The trail section was a little slipperier but still manageable. I'd made the right choice by picking my shoes for the two-thirds of the course that's on-road, not the third that's trail. After three or four kilometres I caught the pair who had left in front of me. They looked very tired, we exchanged greetings and "hang-in-there"s, and I pushed on forward. My first twinge of worry was following the transition to the road section. I pushed a little to keep my rhythm on the flat, but couldn't run down the hill - yup, knee pain! Before long I was finding it hard to run for any more than few minutes, the pain built up gently until it made me stop, then I walked a bit, then I could run for a few minutes again. By the time I hit the mid-point aid station I couldn't run at all, but I could walk - and I could walk fast. For some reason that was fine. I was determined to finish - I need to pop my ultra cherry! I decided there and then to power-hike the whole second half of lap two, and not do any more damage by trying to run. While I was there one of the pair I'd overtaken arrived - from the wrong direction! He'd lost the guy he was running with, and then got lost, and eventually chopped off the whole bottom end of the circuit, so he came back up the course to the aid station to get the distance covered. It was his first ultra, he was determined to get a finish too. 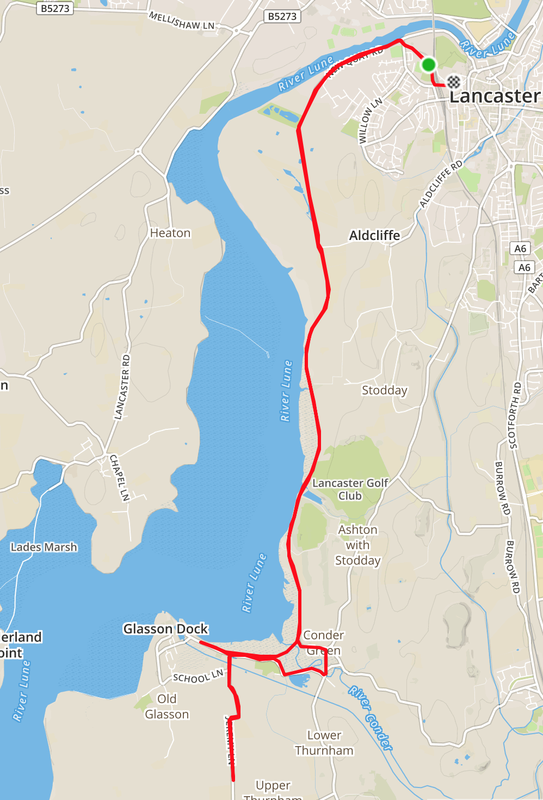 I set off at quite a stride, visualising the various sections of the course that remained - walking it in for 7.5 miles was going to take a while. My knee seemed OK on the flat but was complaining increasingly on gradients. At one point even walking up and down kerbs was uncomfortable! Look at that drop off in pace! 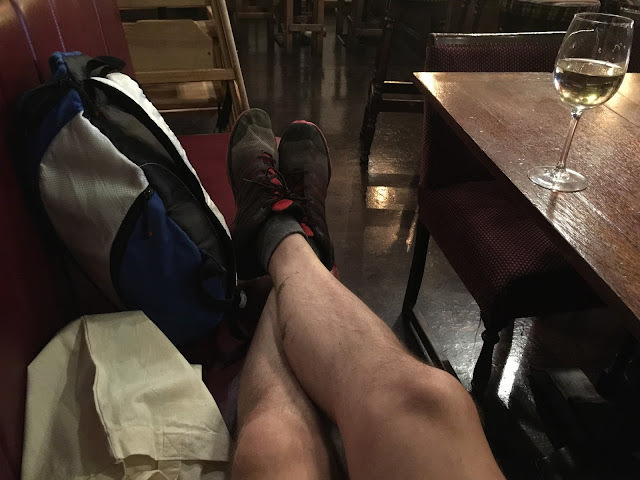 I'm still not sure I'm an "ultra runner", but I certainly covered an ultra distance, and completed an ultra race, so that's good enough for now. Since Sunday I took Monday off exercise, and today (Tuesday) I cycled home from work. Knee is absolutely fine - as soon as the irritation subsides I'm back to normal in no time. We have a train strike for the next few days, so I'll cycle for the next couple of days too, then parkrun on Saturday (of course), and the third 2nd Sunday 5 trail race on Sunday, which I should be right as rain for. I think I'm going to stick to races that are just up to and including half marathon for a while. 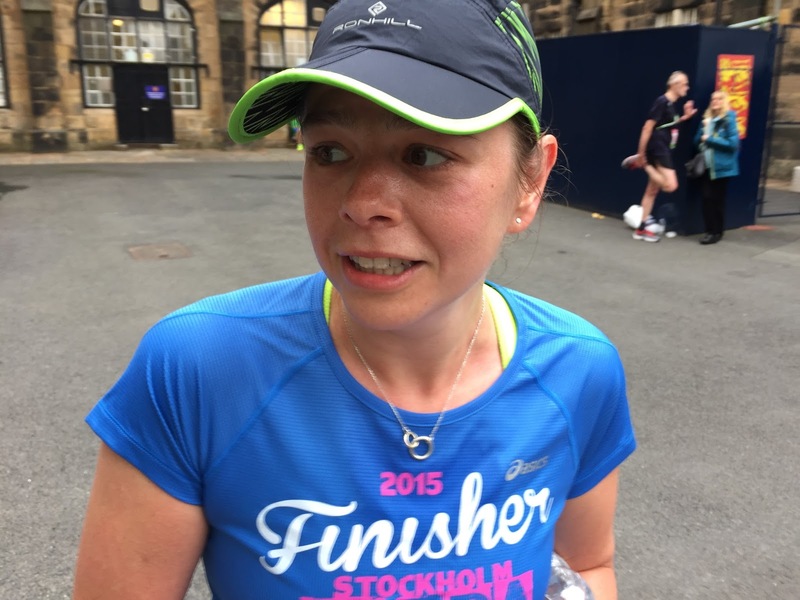 I'll try longer again at some point, but I'm not going to get over excited and enter loads of races (I was kind of considering some 50-milers next year - but there's utterly no point if it's 25 miles running, and then 25 miles "walking it in"). Race photos are here, but apart from the start line shot I was too slow to end up in any of them! The official results are here, together with a short blog post form the organiser. The men's race was won by last year's winner, David Ross, in a new course record of 3:43. The women's race was won by Daisy Rolfe in 5:02. I eventually rolled in at around 6:20, but I managed not to come last! Mrs is away on business so I decided to check out an inaugural parkrun (yes, I still go to them sometimes), so off to Tewkesbury parkrun I went. The course is four laps of a field, not the most inspiring layout but it has the almost unique quality of being able to see all almost the runners almost all the time. With tomorrow's Ultra finally upon me, the day called for a gentle jog round. This was enforced by forgetting my running shorts, thankfully I had some casual summer shorts with me, so I jogged round in those. I don't usually comment on parkrun distance accuracy; just because my Garmin reads 4.95km or 5.05km doesn't mean that the parkrun universe will implode. 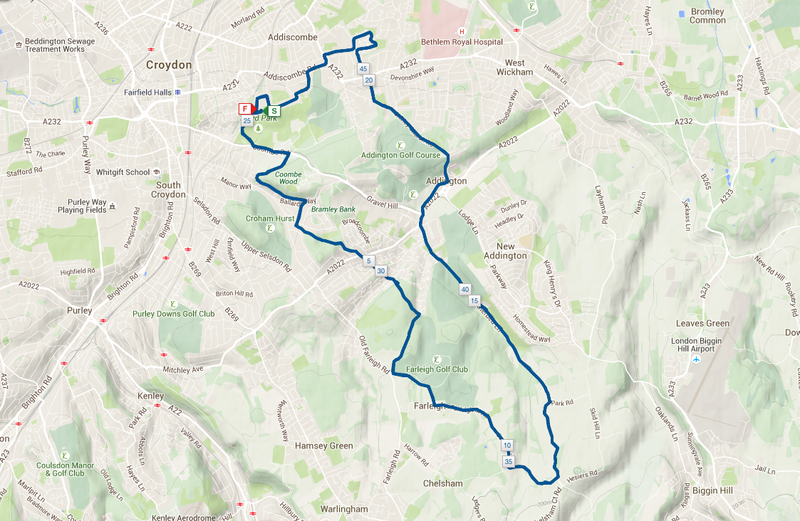 However today's route only measured 4.45km which I think is probably worth taking a look at! 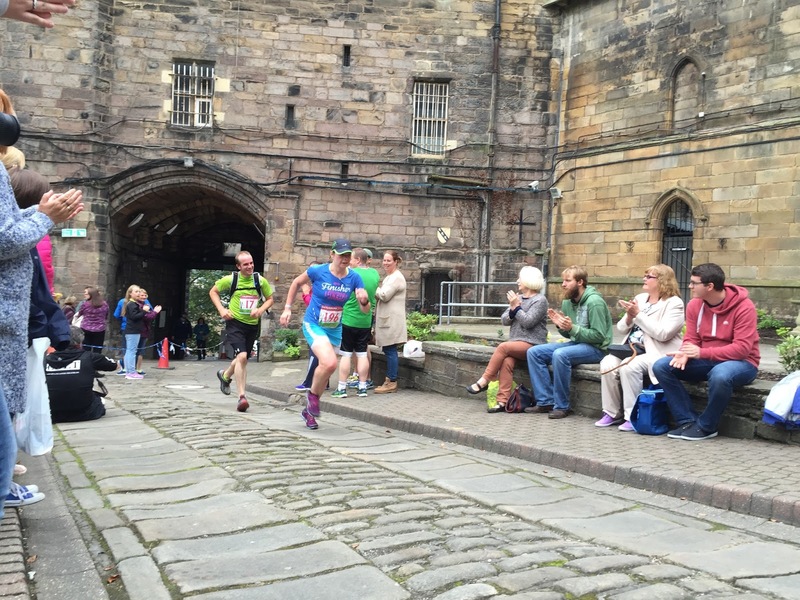 I was a bit surprised at my time, I was only plodding! It's a beautiful friendly run, I wish them much success in the future. It'll be an interesting course if we have a long wet season, expect cancellations and/or muddy knees from the short steep bit between the fields!